58 Friday May 14th 1875. To school and back today. I finished my big wheel tidy tonight my how pretty it is. I worked awhile on the sleeves to my linin dress. 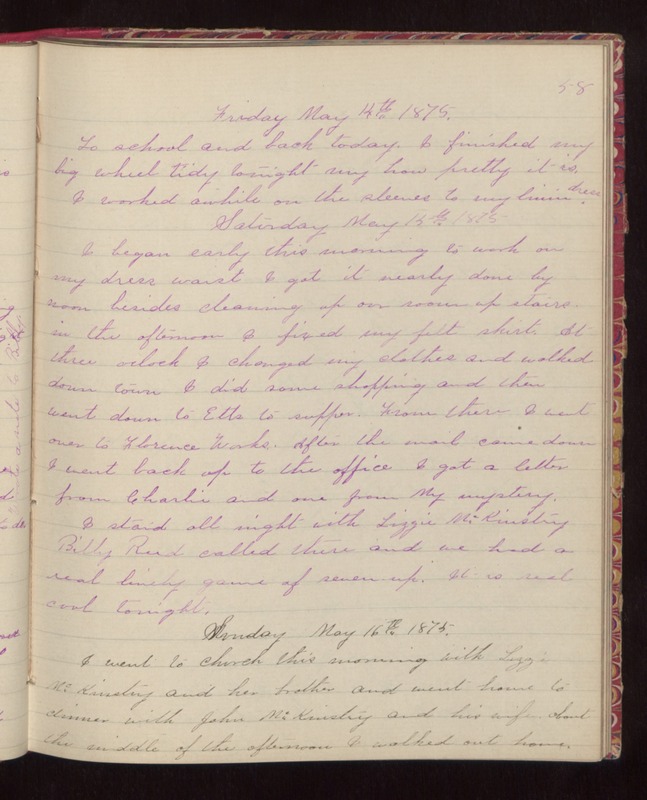 Saturday May 15th 1875 I began early this morning to work on my dress waist I got it nearly done by noon besides cleaning up our room up stairs. in the afternoon I fixed my felt skirt. At three oclock I changed my clothes and walked down town I did some shopping and then went down to Etts to supper. From there I went over to Florence Works. After the mail came down I went back up to the office I got a letter from Charlie and one from My mystery. I staid all night with Lizzie McKinstry Billy Reed called there and we had a real lively game of seven-up. It is real cool tonight. Sunday May 16th 1875. I went to church this morning with Lizzie McKinstry and her brother and went home to dinner with John McKinstry and his wife about the middle of the afternoon I walked out home.